Golf is one off the most popular sports there is, not just because professional players can earn such great prizes at championships but also because it is a sport that just about anyone can enjoy. Golfing is a perfectly suitable game for children as young as five years of age all the way up to senior stage. It is a great sport to get you out of the house onto the open field where you can enjoy plenty of fresh air and long walks to improve your health. This popular sport dates back to the 15th century and was developed by people living on the eastern coast of Scotland in the Kingdom of Fire. The first games were played with a stick or primitive club and players would hit a round pebble around a natural course filled with dunes, rabbit runs and tracks. Modern golf is much different from the birth stages of this game. Today golfing has a lot of rules to follow and you can shop the best modern tech golfing gear that can make a huge difference in your gameplay. One of first things you will need when you are a beginner in golf is a good driver. A golf driver is one of many standard golf clubs that most golfers carry with them as they set out on the course. The golf driver is the golf club that has the largest club head, the longest shaft and the least amount of loft with exception to golfing putters. This handy tool is used for hitting the ball straight all the way down the course. To effectively hit your ball or use your golf driver you do need to master the full swing, have superb hand and eye coordination and you need to have a bit of experience in accessing environmental aspects such as your golf course layout, wind and other external factors. The amount of experience you have with golfing is just as important as the type of gear you use for this tricky game. In this review we are going to discuss the best golf drivers that beginners can buy this year. Our review takes you through all the best golfing clubs available on the market right now and gives you plenty of other beginners advice to help ease your golfing journey. It is important to take note that the best golf driver on the market isn’t necessarily the best driver for you. High-end drivers are built for those with advanced skills and while you can use one of these fancy drivers for entry level playing, it is hardly a worthy investment since you are still learning the game and finding out what works for you. The driver is the most challenging golf club to master and the right type of driver will make it lot easier to become an advanced golfer. For beginners it is best to choose a driver that gets your ball into the air without sending it soaring into hard to reach areas. Something with good swing but less impact power is best until you master your swing, aim and drive. A forgiving driver makes it much easier for you to hit the ball with ease and to get it off the ground while you are practicing your swing. There are lots of things that affect the forgiveness of a driver such as a bigger club head size, a back positioned CG, higher MOI rate, a higher loft and a shorter but more flexible shaft is better for beginners who are going to hit plenty of off-center hits. The bigger your club head is the bigger your sweets pot is and the bigger your chances are of getting your ball into the air with minimal practice. Choose a driver head that allows 460cc or bigger because anything smaller will be harder to master. Club drivers have a center of gravity built into the driver. Some drivers have a back located center of gravity (a GG) while others have a center of gravity located in the front of the driver (CG). Clubs with a GG produces higher launch and faster closure rate or helps reduce your slice and is thus better for beginners. The higher your club’s Moi range is, the higher the balls speed will be or the further your ball distance. For beginners it is probably best to choose a high Moi rate since it can be tricky for beginners to improve their reach when muscles are still underdeveloped and when your swing isn’t what it could be just yet. With a higher MOI you can go the distance without quite as much effort or practice. A driver with a higher loft is more suitable for beginners because it produces less sidespin and more backspin. The higher backspin gets your ball into the air easier and the reduced side spin keeps your ball going in a straight direction. There are drivers that come out with adjustable lofts but you can also invest in non-adjustable lofts that range from 7 - 13 degrees. The driver’s shaft can vary in flex and length and the type of shaft you have will have a huge impact on your swing. Golf drivers are manufactured in extra stiff, stiff, regular and senior flexes. A more flexible shaft is better for beginners because it creates a higher launch and shots don’t lean to the right as much. The length of your shaft has more to do with the distance the ball goes than your length. A longer shaft enhances distance but the longer your shaft is the less control you have over the ball and the harder it is to hit the ball on the club’s sweetspot. For beginners it is best to choose a shorter shaft so you can gain more control over your ball and club even if that means sacrificing a bit of distance or speed. Driver shafts are made of different types of materials such as steel, graphite, nanofuse or combination materials. The materials affects the durability and weight of your driver. Steel shafts are generally more affordable, durable and tougher but can be heavier. Graphite shafts are the best option for novice golfers and especially for female golfers because the material is lighter and allows for a greater variety of flexes although these shafts are more expensive and fragile. Nanofuse shafts are the latest in shaft material and consist of a combination of materials such as carbon fibers and metal. These shafts are more durable than graphite and not as heavy as steel but they are the most expensive shaft types. Price does of course have a huge impact on your driver selection. There are some brands that are specially made for advanced or pro players while others focus on the general market or on beginners. If you have the money then by all means; indulge in the best driver on the market. 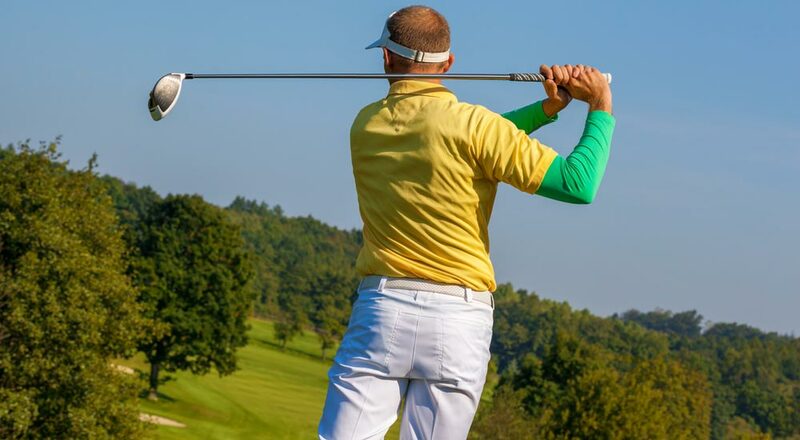 But if you are not sure that the golfing hobby will stick and need something to help you perfect your skills then choose something that is relatively affordable. Don’t choose a cheap golf driver or brand because there could be design flaws that will certainly affect your ability to play golf. Drivers are built for a specific dominant hand. If you are left handed then be sure to look for a left handed golf club. Most golfing clubs look pretty similar and many golfing institutions enforce rules that affect the design of these clubs. For example, in America you can’t buy a club head greater than 460cc and shafts can’t be longer than 48 inches or shorter than 18 inches. Rules on the club face, the type of grooves the club has and other features also results in the uniform look and design of golfclubs. Be sure to ask for help if you don’t understand how to spot the difference in shafts. With a bit of guidance you can find a club with the right head size, a bigger sweetspot, a higher loft and a shorter shaft with ease. TaylorMade is a popular golf club brand that is known for creating quality products for many years. The 2017 TaylorMade M2 is a superb selection for beginner golfers because it offers great forgiveness and delivers punches made for distance. The club is made of 7-layer carbon composite crown or multi-material that results in a very light, very thin yet very strong golfclub - which is exactly what you need for a beginner. The 2017 M2 features a Seed Pocket that is 3x more flexible than the original design. The club head has a low CG construction and has an adjustable loft with 12 adjustable settings. This club is available in different flexes and shaft lengths so you can choose something suitable for your level. This is another best overall driver you can buy if you are just starting out in golfing and the Callaway brand is calling this their most forgiving driver which makes it perfect for you. 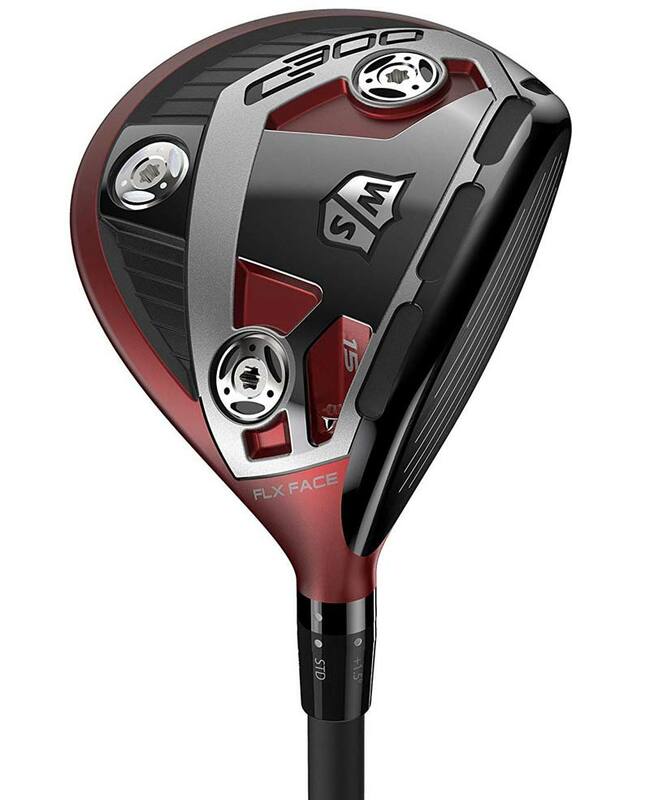 The driver has a higher MOI rate for faster ball speed and is fitted with a fashionable next generation R*MOTO face. The club has a bigger footprint, is very light and is made of 19% thinner materials. This is a good driver for beginners because it increases MOI for more distance and speed and it offers great forgiveness on off-center hits. The club has adjustable weight system with two center of gravity settings; one of the back and one in the heel. This adjustability makes it perfect for beginners as they advance. 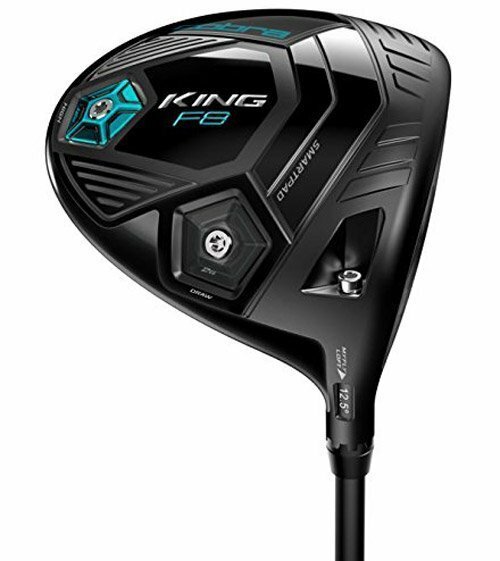 The King FS8 has 8 adjustable loft settings to tune launch, spin and distance and the bigger club head offers a nice and spacious sweet spot. This is another superb drier for those looking for something that offers excellent forgiveness. 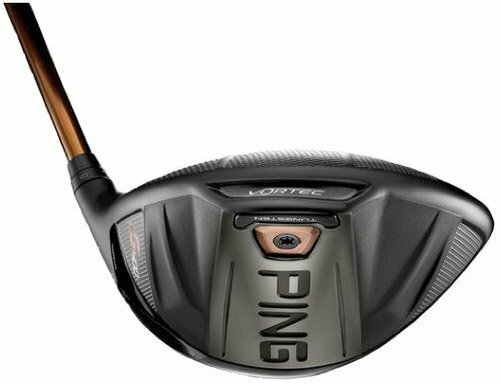 The Ping G400 SFT is designed with multi-materials and drag reducing technology. 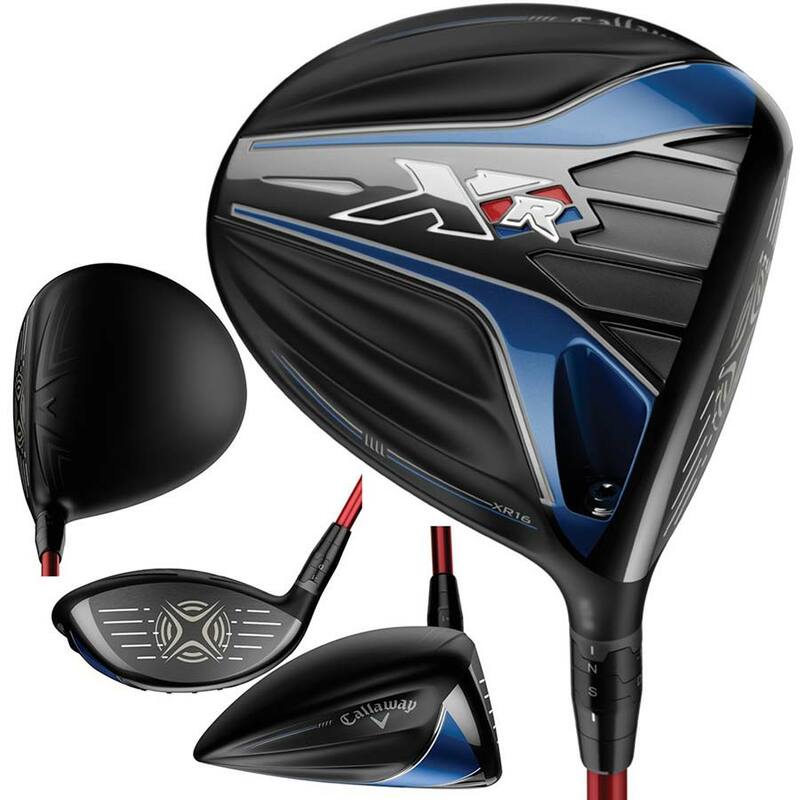 This driver has an aerodynamic design created by Vortec Technology that reduces drag by 15% for enhanced speed. The driver has a 6% thinner flex that offers 16% more flexing. It has a high MOI level and the deepest CG location legally allowed. This driver is built for speed. The Mizuno GT-180 is designed with SP700 Titanium Face technology that increases ball speed and distance. You can adjust the visual face angle slider in order to make stronger natural swings. Quick Switch Adaptor assists in launch optimization so you can perform your very best at every new course you take on. This is a good investment for female golfers. 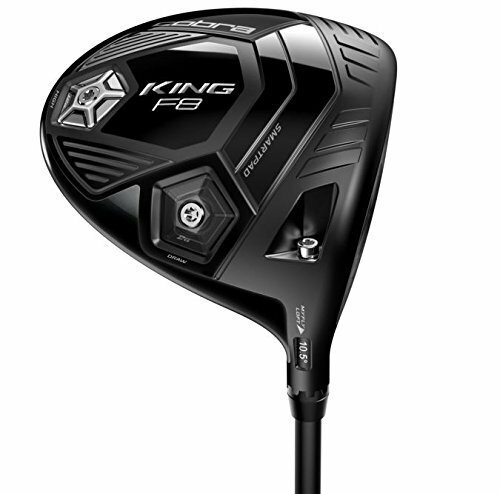 The King F8S offers great forgiveness, more distance and faster speed on off-center hits. This driver has two adjustable center of gravity center settings; one in the back for higher tower ball flights and one in the heel for additional draw. The club has 8 adjustable loft settings to help you tune launch and spin in different weather conditions. A bigger club head offers a bigger sweet spot and increased Moi boosts your hit range dramatically. The TaylorMade is another superb investment for beginner female golfers. This driver is designed with speed injection features to maximize ball speed and distance. It has a revolutionary new face curvature that corrects your hit on of- center hits and the bat is engineered to reduce spin for straighter shots. The Twist Face feature also provides more loft in the high toe and less in the low heel. The club has a sleek and aerodynamic shape, weighs only 46 grams and the larger head has a bigger sweet spot for enhanced forgiveness. This driver has a lighter swing weight which makes it perfect for beginners that wants to get in lots of practice without feeling fatigued and sore. The G410 SFT (Straight Flight Technology) is designed to deliver straight ball hits. It is engineered with a fixed weight in the clubhead and a heel-side CG that keeps your ball straight and that reduces spin on off-center hits. It is designed with an 8gram counterweight in the grip of the shaft which increases energy transfer to momentum as you hit for greater speed. The driver is very forgiving with a 455cc head and a rather big sweetspot. 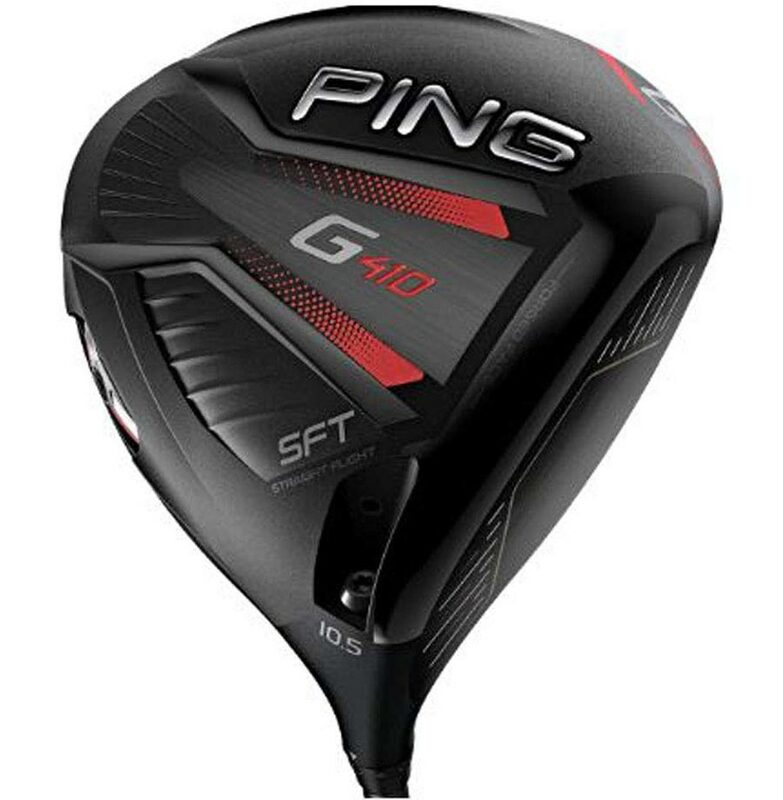 This is a budget friendly yet great driver for beginner women golfers that want to give golfing a try but are not sure if the hobby will catch on. The driver is available in right and left side and has a 14 degree head. It has an aerodynamic design that is engineered for max speed and more distance. The soft triangle shape of the club enhances MOI and it has CG to the back of the club for enhanced trajectory on hits. The driver has a graphite shaft which is perfect for women since the material is much lighter and perfect for long practice sessions. If you love the Cobra brand but are enjoying your hobby on a tight budget then this is the right beginners driver for you. The F-Max Fairway I beautiful in design and it is quite affordable. It is only available in right hand design and is designed for golfers with a moderate swing speed. It has back positioned CG which results in higher launch and reduced spin. 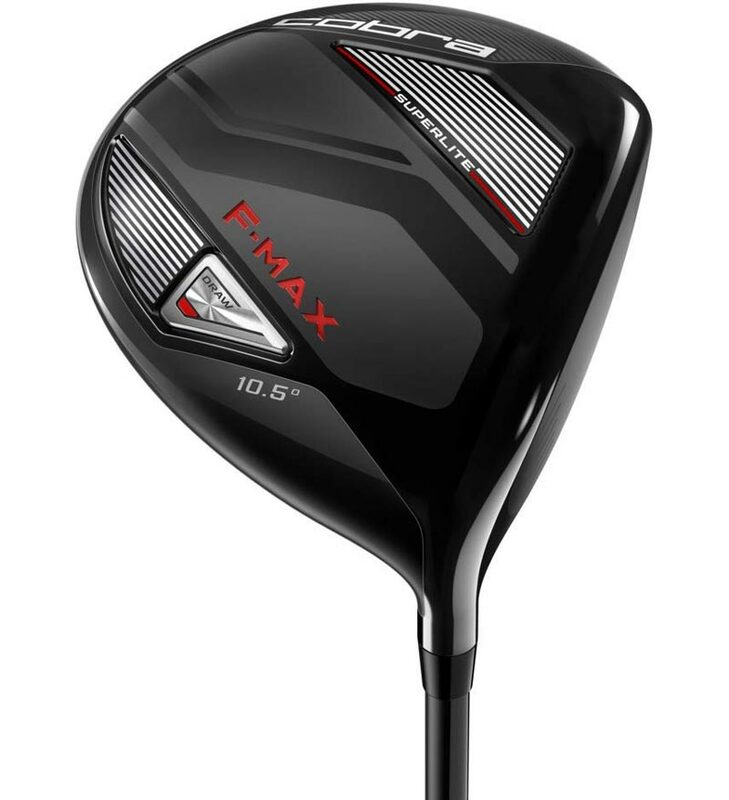 The F-Max is one of the lightest clubs for women. This is one of the best picks for male golfers in their beginning phase. 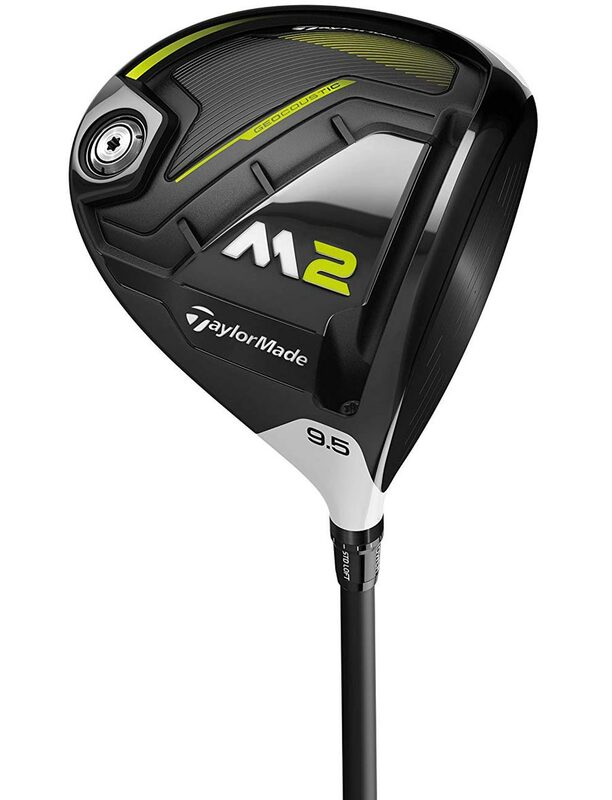 The TaylorMade M2 has one of the best designs since it consists of a multi-material construction which makes it lighter yet stronger. This driver is considered the number 1 driver when it comes to popularity. It offers great acoustics, is light in weight and offers beginners terrific forgiveness with its nice and large club head size and bigger sweet spot. 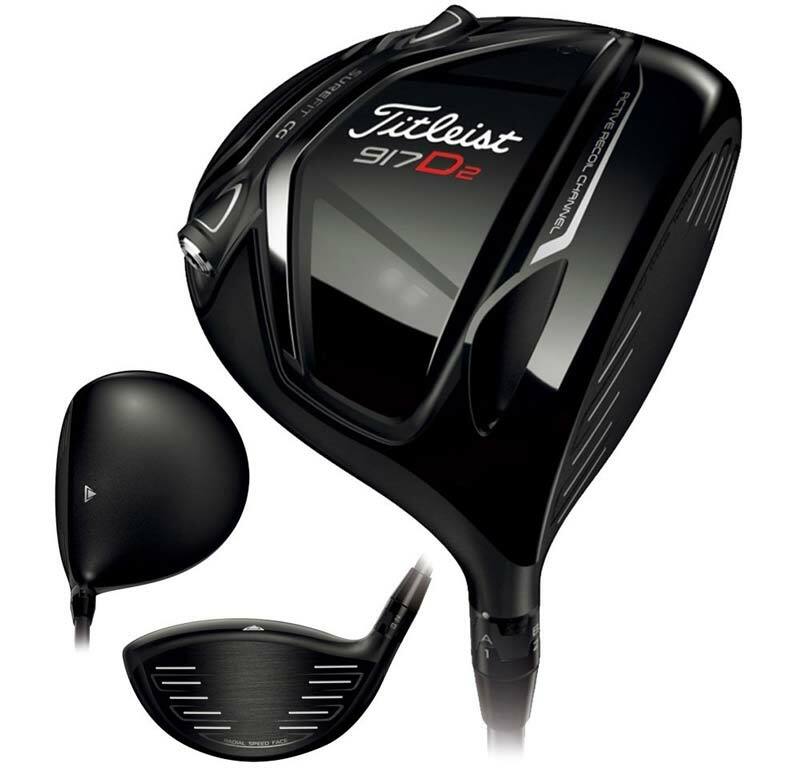 The driver has an adjustable loft with 12 settings and it comes in four different flexes and is right and left handed. The Cobra F-Max Superlight Straight Neck is one of the most forgiving drivers made by this superb brand. It is a superb investment for beginner golfing men because it is incredibly light at just 287 grams. The driver is designed with face technology and has a thin titanium face that enhances ball speed and distance across the entire face of the driver. The CG is positioned at the low back of the driver and promotes a higher launch and reduces spin. The driver is also available in offset design for those that want a more traditional look. This is a budget friendly driver for beginner male golfers that are not perfectly sure if they want to pursue this outdoorsy hobby with enthusiasm just yet. The Wilson Staff C300 Fairway Wood is only available in right hand sided and comes in different head sizes. The club flexes quite dramatically at impact which results in much more ball speed or distance. The head also has six power holes placed at the crown which gives a much bigger sweet spot and as such enhances greater forgiveness. If you love a flashy and eye catching driver then this is the right pick for you. The Cobra King F9 has a beautiful design with lots of bright highlights. It comes in left and right handed design and is designed for aerodynamics. The aerodynamic design, light multi material structure and low CG makes it the fastest Cobra driver currently on the market. It is designed for low speed and extreme distance and was manufactured using the most advanced manufacturing machinery and systems currently available on the market. 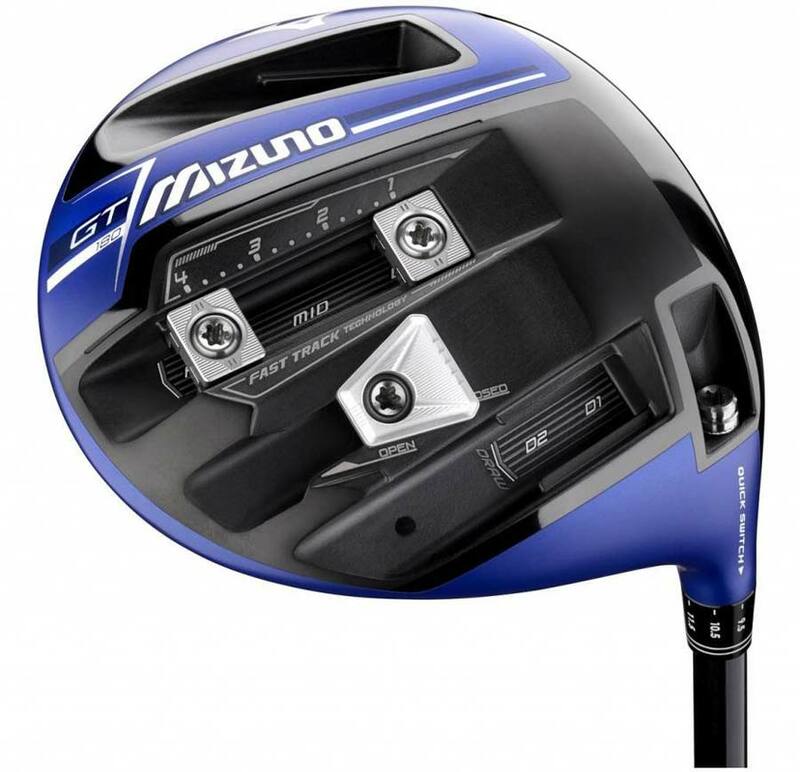 This Driver has a 460cc profile with a nice and big sweetspot that is perfect for beginner male golfers. The driver offers excellent forgiveness. The driver allows you to move the CG without affecting the MOI. 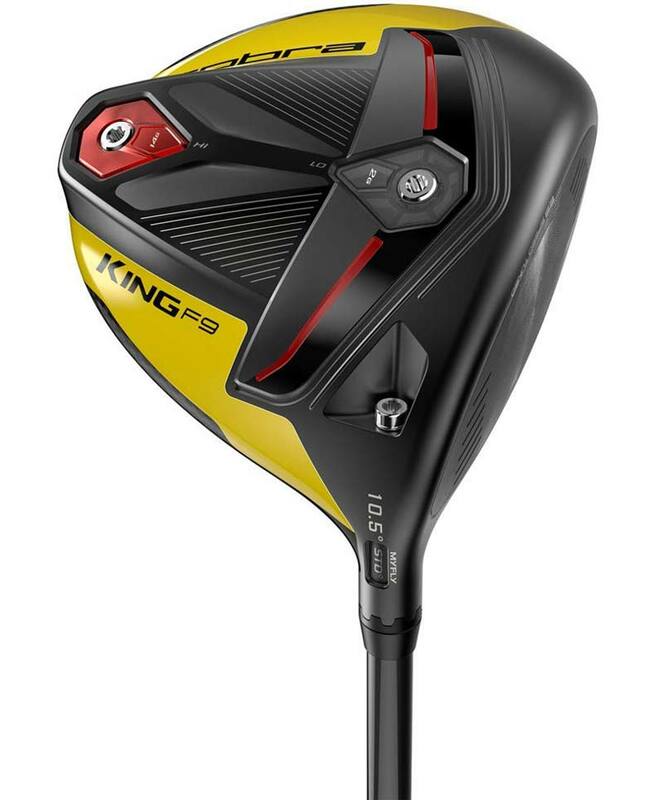 The driver is designed to increase your speed and distance and offers more consistant impact, more consistent spin and it has swing weight adjustability. The driver has 16 independent loft and lie settings that allows you to control your hits much better in an unpredictable environment. All of these drivers are superb pick for beginner golfers. If you are looking for a good driver then be sure to pick one of the best overall drivers. Women can most certainly peruse our best golf drivers for lady golfers and men with a strong build can definitely benefit from our best golf drivers for men. The most important thing to remember when choosing a good beginner driver is to focus on the features you need. Don’t buy the best and most expensive driver. Choose one that suits your need right now. There will always be time to add to your collection as you progress in skill. The best drivers for beginners are those with bigger head sizes because the impact surface or sweetspot on these is much bigger and it makes it much easier for you to get good results even though your hit might be slightly off-center. Shorter shafts are better for women or for men who want more control over their hits. Longer shafts and a CG club design are preferable for those who are looking for speed or that want their hits to really go the distance. A lighter driver is always best for newbie golfers since your body isn’t quite used to all of that movement just yet. A lighter driver also makes it easier to get in more practice without straining your body. You can also go for a driver with a higher MOI rating for enhanced speed and the more flex your driver has the higher impact shots you can deliver for fast results. 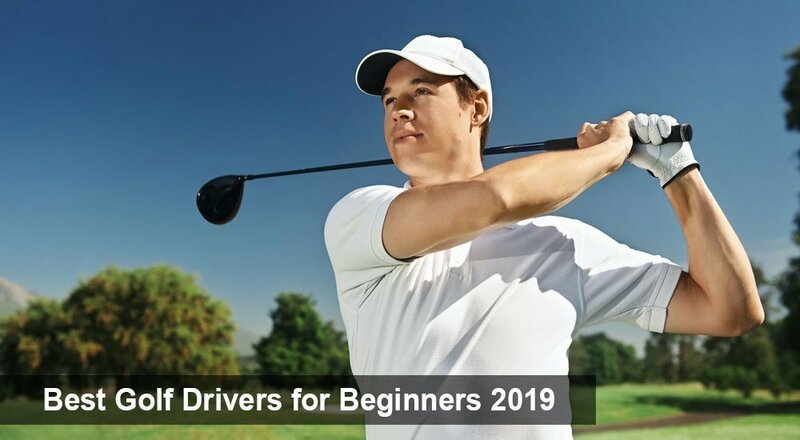 We do hope that this quick review on all the best golf drivers for beginners in 2019 was helpful for finding the perfect golf driver for both practice golfing sessions and casual playtime with friends and family. Golfing is a superb sport that offers you plenty of positive health and mental benefits. With this hobby and the right type of golfing driver you can live a healthier, active and happy lifestyle without feeling frustrated in your game. The life of a medical professional can be quite hectic. Unlike other professions where you get used to day to day tasks, a job in the medical line is always changing and each day can be packed with lots of unexpected surprises. In a career where every day can easily turn into chaos, you really do need medical equipment you can rely on. A stethoscope is one of the most frequently used pieces of medical equipment you will ever own whether you are still a med student, a nurse or a highly qualified medical expert. It is the one device you will use on all routine checkups, all patients and for all diagnoses. It is much better to invest in a good quality stethoscope that will last you a long time than to simply buy something cheap because you need one. Your understanding of your medical equipment improves over time, in the same way, your skills as a medical professional improves. When you know and trust your stethoscope you find it easier to understand the difference between different sounds and frequencies which enable you to make more accurate diagnosis. If you are using a different stethoscope every other week, you don’t get used to the sound quality of yours and it becomes much harder for you to identify sound differences. If you are looking for a good quality stethoscope that will benefit you from student years all the way through your career as a qualified medical professional then we highly recommend the Littmann Cardiology 4 Stethoscope. 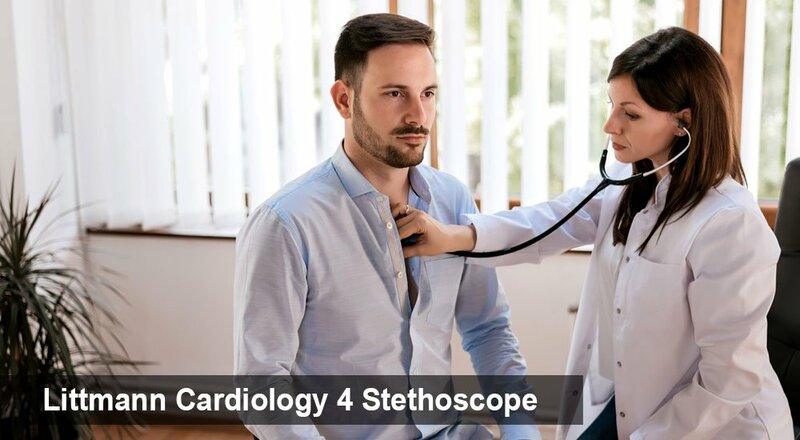 All of these are quite fantastic stethoscopes but in this review article, you will learn more about the Littmann Cardiology IV Stethoscope and all of its brilliant features. This terrific stethoscope is the upgrade of the Littmann Cardiology III stethoscope and has several advanced features that the older model lacked. This stethoscope is ideal for cardiology or for high-performance tasks and is suitable for both adult to infant patients. Everything about this stethoscope from its tubing to its diaphragms is highly advanced and modernized. Overall this stethoscope looks brilliant. The Littmann Cardiology IV is available in 9 different colors with 7 different shades which are perfect for staying unique and fashionable in your line of work. The sleek design and branded bell cover cap sure do provide high quality and great overall look for this stethoscope. The stethoscope is made of dual lumen next-generation tubing that doesn’t contain any traces of latex which is preferable for medical professionals and patients with latex allergies. The double-sided chest piece is tunable on each side with an open bell on the one side. The stethoscope is perfect for challenging environments such as the ED, ICU, cardiac ICU and is also functional for medical student environments as well as general medical practices. Dual lumen next-generation tubing insulates sounds which result in crystal clear audibility. A thicker bell height also enhances acoustics in the stethoscope and double-sided individual tubing allows you to pick up challenging sounds much better. The one side of the diaphragm is fitted with an open bell that is fitted with a removable cover which keeps the bell clean. The chest piece is made of stainless steel which is resistant to oils and alcohol and enhances the durability of your stethoscope. The stethoscope only weighs 117 grams which are perfect for preventing fatigue during those long hours on the job and durable next generation rubber allows you to roll the stethoscope into your pocket and ensures great durability. The Littmann Cardiology IV is one of the best stethoscopes you can possibly own. 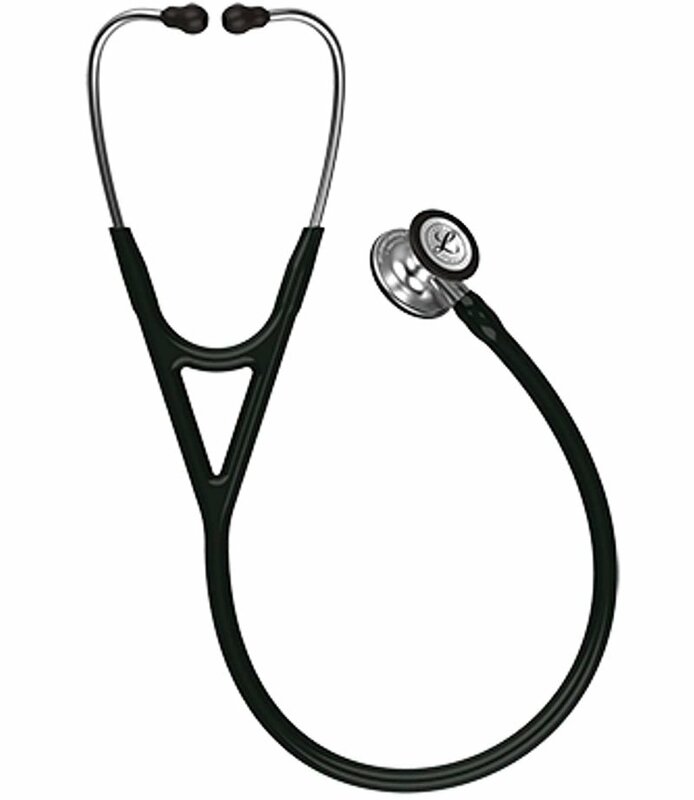 The stethoscope is a good investment for both qualified and student medical professionals. It is a device that will provide you great functionality through the years. The stethoscope is however recommended for advanced medical professionals. Other medical workers such as nurses often find the advanced features over the top and unnecessary since they are mostly responsible for taking blood pressure levels and monitoring vitals. 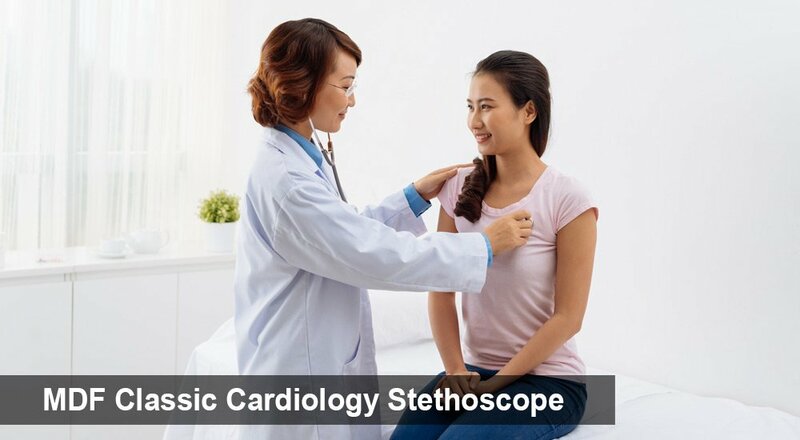 But if you are a cardiology professional or work in high pressure and unpredictable fields such as the ER then we highly recommend this stethoscope with its advanced technology, its better audibility, and its enhanced acoustics. It is a device you will learn to rely on time and time again, that will help you make a more accurate diagnosis and that will accompany you through challenging tasks and long working hours for many years to come. We all have our weapon of choice for completing specific tasks in our line of work. A hairdresser has a specific pair of scissors she loves, an artist’s chooses a specific brush as his favorite weapon of choice and for doctors, their stethoscopes are usually their most loved tool of the trade. These special weapons allow us to perform our tasks with ease and agility and lends us unique characteristics that others later use to identify with us. The style of your weapon of choice can also lend you a certain amount of charm and status. It is important for medical professionals to choose wisely when selecting their stethoscopes. These medical tools, like all other medical equipment, don’t come cheap and the type of stethoscope you have can have a huge impact on your work or even on your performance as a medical student. Littmann is one of the best stethoscope brands available on the market. Thousands of medical experts and med students invest and love these specific stethoscope types because the brand has been known to create high-quality stethoscopes that are incredibly durable, functional, light and practical. 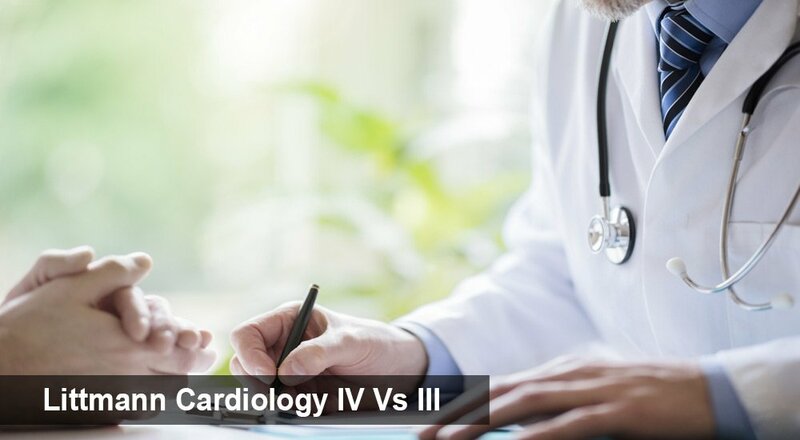 If you are in the cardiology division then you might be tempted to buy one of their high-performance cardiology stethoscopes such as the Cardiology IV or the Cardiology III. Deciding between these two is going to be tough since they are both exceptionally good stethoscopes. But which one is the best pick for you? The older Cardiology III or the all-new Cardiology IV? Perhaps this comparison will help you choose. The Littmann Cardiology III is the predicator of the Cardiology IV and if you happen to have the honor of working with one of these stethoscopes then you will be able to witness that it is pure joy. 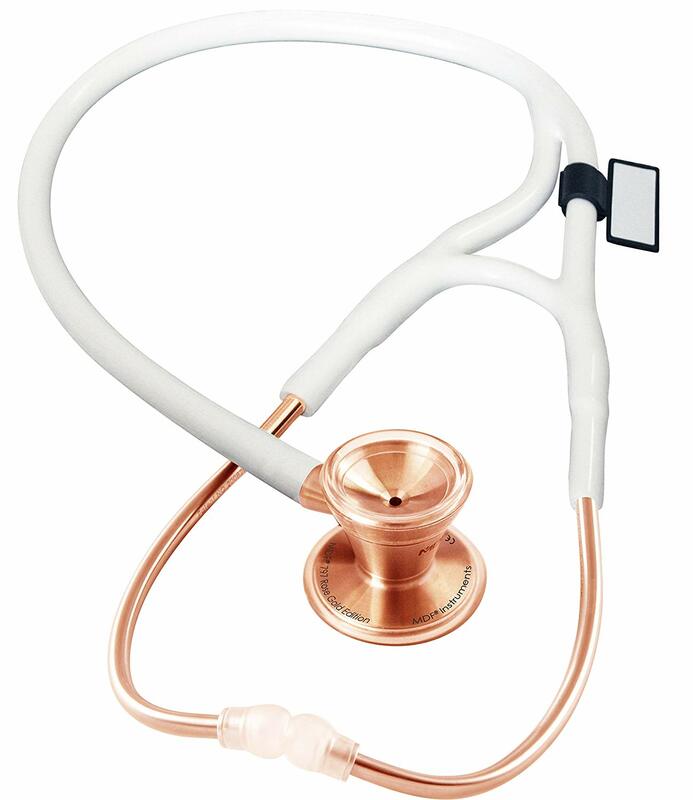 This stethoscope has the same beautiful design we have come to love about Littmann’s ranges. It is fitted with a machined stainless steel chest piece that is oil and alcohol resistant and has a dual lumen tube that doesn’t consist of any latex – a huge benefit to medical professionals and patients with latex allergies. The stethoscope is lightweight, has a two-piece diaphragm that many claims are challenging to put together when you are cleaning your stethoscope and it is fitted with a double-sided chestpiece. This is a cardiology high-performance stethoscope that has been used, trusted and loved by medical professionals until the Cardiology IV made its appearance. The Littmann Cardiology IV is an upgrade on the Cardiology III. It is based on the same glorious design and features but with quite a few improvements that cardiologists cannot seem to praise enough. The main difference between the new Cardiology IV and the older Cardiology III is the better audibility. You can hear higher frequency sounds to help you learn more about your patients' health. The single-piece tunable diaphragms allow you to hear low and high frequency sounds on adult and children patients on both either of the more suitable sides of the chestpiece. The Pediatric side converts to an open bell that you can keep covered with the small diaphragm. One of the best improvements is the one piece diaphragm unit because the device is much easier to put together after cleanups. The Cardiology IV has a thicker or higher bell which results in the better acoustics. It also weighs 5 grams less than the Cardiology III which is beneficial for medical professionals who are always hustling and bustling. Like the Cardiology III the stethoscope also consists of new-generation tubing that contains no traces of latex. This is a beneficial feature for medical professionals and patients who might be allergic to latex. The machined stainless steel bell or chest piece is oil and alcohol resistant which ensures great durability. If you happen to already have a Littmann Cardiology III then you certainly didn’t make a bad purchase. This is a terrific stethoscope for both students and professionals alike. But if you are newly buying your stethoscope then spending those few extra dollars on the new and improved Littmann Cardiology IV certainly will be worth your while. The lighter weight, easier assembly and enhanced audibility will give you lots of practicality while you are helping patients and will enable you to clearly hear high to low frequencies that could give you valuable information on the condition of your patients. If you consider the fact that those inaudible sounds could make a huge difference in the health of a patient then the Cardiology IV certainly is worth the extra money. Wearing the proper crossfit clothing when doing crossfit workouts is not an extra benefit, it is important and can help improve your time or your reps. If you don't wear the proper crossfit clothing you could end up losing a competition or end up being slower due to having to adjust your shirts or your pants, i've been there before, many times. Choosing the right crossfit shorts is key to ensure that you stay comfortable during the workout. Ill-fitted shorts, too loose and large or too fitted and small, will not only cause discomfort but also restrict your movement. Finding the best crossfit shorts for men and women, will ensure a smooth workout and keep you confident as well as motivated. These bottoms are made for agility and are perfect for CrossFit and cardio workouts. Made from resilient 4-way stretch fabric with 87% Polyester and 13% spandex, they are woven for mobility. The fitting is CrossFit specific with a 10” inseam. The shorts feature a Cordlock closure system with elastic which ensures that the shorts are intact throughout the workout. The shorts also have a water-repellent finish to keep the other layers of the fabric protected from moisture. The shorts feature a graphic along the front and a small company logo as well. They are available in three colors; burnt amber, black and chalk green. These slim-fit shorts feature the Speedwick technology, which ensures that sweat or water does not seep into the shorts during a workout. 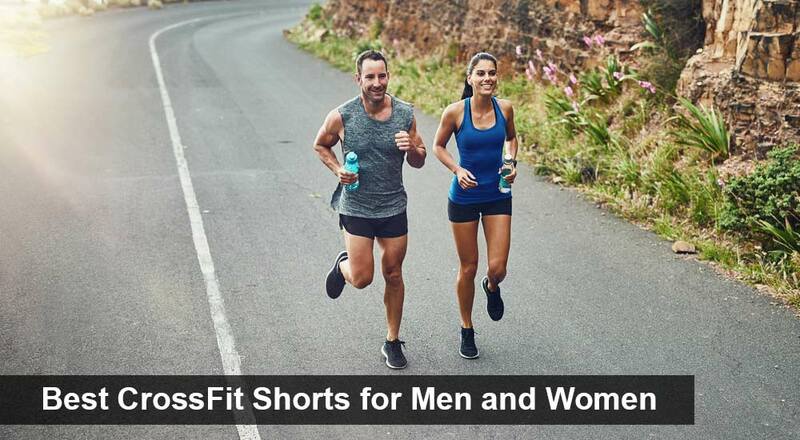 With these shorts, you need not to worry about exercising in the scorching heat of summer or even outside on a rainy day, as the shorts keep you cool and dry. The shorts are designed for CrossFit workouts, working out in the gym and are ideal for warm weather. Fitting is made adjustable with a drawcord waistband at the waist, this can allow a firm hold for workouts or running. Textured knit fabric has been used to add comfort along with performance. Hand pockets have also been added for storage, so you do not have to worry about losing your keys when you hit the gym. The Reebok Communities most requested for shorts are made following the specifications and demand of the people. They are ultra-lightweight, comfortable and designed to move with you. Although originally inspiration was from traditional shorts, they have been geared towards the CrossFit shorts model. They have a CrossFit specific fit with a 9” inseam, a high side slit and gusset has been added for maximum mobility. Speedwick technology has been used to make them water resistant and keep you cool and dry. Antimicrobial inner briefs have also been added to prevent odor. With 82% Polyester and 12% spandex, the material has been woven for comfort. Side pockets have also been added to allow room for storage. The shorts are a perfect blend of comfort, mobility, and practicality. These shorts are versatile to be used for any type of CrossFit workout. Ultralight fabric, made up from polyester and elastane, is used to make the shorts. Their light weight allows you to not be worried about any restrictions while running or exercising. They are made with fitting in mind specifically for CrossFit with an 8” inseam, the shorts have an easy-on elastic waistband. They also have a drawstring for custom fitting. Hand pockets have been added to allow room for storage. The shorts feature a unique stone camo print which is made up of atlas stones and bumper plates that were smashed and repurposed for a unique visual effect. The design is made on both front and back. 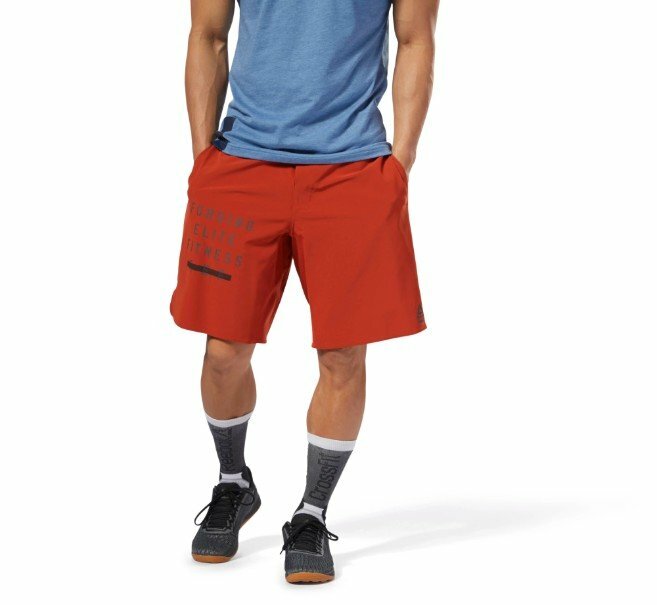 The Reebok Knit Waistband Shorts are slim-fit with a 2.5” inseam and are made from lightweight stretch woven fabric, 86% polyester and 14% spandex, and a laser-cut edge, which provides for unrestricted movement. Fitting can be done to your personal preference with the drawcord in the wide stretch knit waistband. Antimicrobial treatment is done in order to fight odor. Sweat cannot be a problem since the Speedwick technology slides water and sweat away keeping you cool and dry during a workout. The shorts are a mix of comfort and mobility. They also feature a great design with a graphic on the front as well as a small Reebok brand logo. 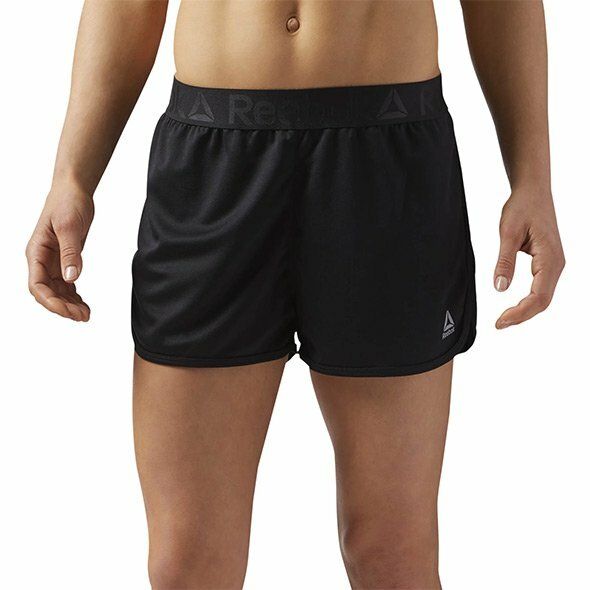 These running shorts have two shorts, a slim outer short and a fitted inside short. Together, they provide both confidences with the support of the fitted shorts and agility to run with the slim outer shorts. Lightweight fabric is used for both the inner and outer shorts, and they are made of polyester and spandex. They feature Speedwick technology which keeps the shorts and the runner dry and comfortable. For safety, 360-degree reflectivity has been added to make the shorts prominent from afar. This can let you go for a run at night and not be worried about passing cars. They are available in black color. These shorts are ideal for running and cardio, for both indoors and outdoors. 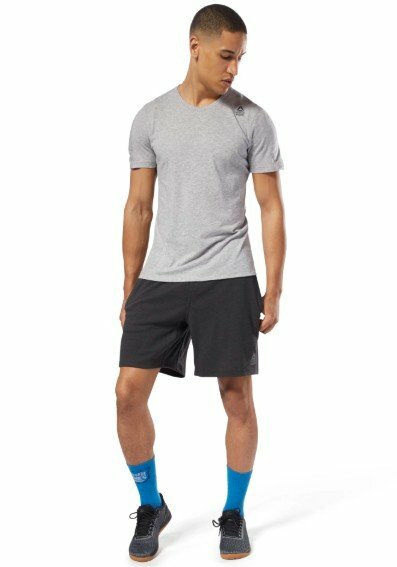 Made out of 100% polyester and a plain knit for endurance, the shorts have a relaxed fit wearing loosely from the body to give the maximum room for movement and have a 2.5” inseam. An exposed waistband allows you to get a fit to keep the shorts in their place. Slightly shaped hems also help to add coverage. The shorts are also water resistant using Speedwick technology. The movement and fit are perfect for use in the gym, for cardio and in warm weather. The loose fit allows not the only movement to run, but also room to stay cool on hot days. These slim fit shorts are built for use in the gym and for cardio. Speedwick technology makes the shorts water resistant and allows you to exercise without getting wet. They are designed to be used well in warm days. The shorts also have a drawcord waistband to adjust for a custom fit according to your need. Comfort is ensured by using 100% polyester fabric woven to make your workout free from any restrictions or annoyance. 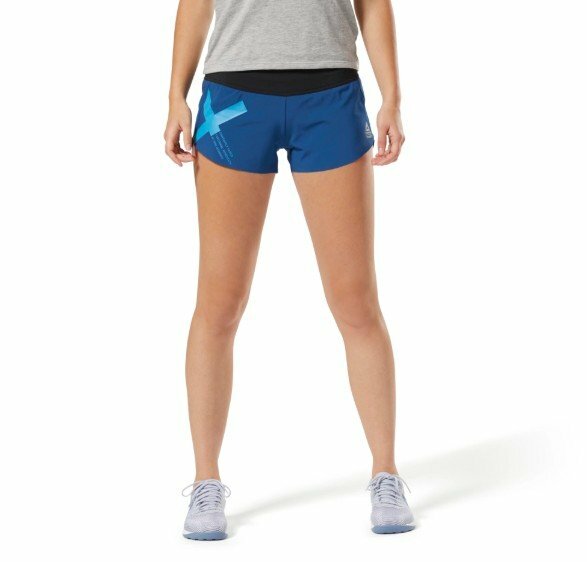 Graphic design covers the shorts all over, adding style to your workout so you can keep up with fashion while you exercise. The product is available in three colors. In this article, we’re going to look at some of the greatest vape mod starter kits for 2017. If you’re new to the vaping world, this particular market can be difficult to navigate for beginners. 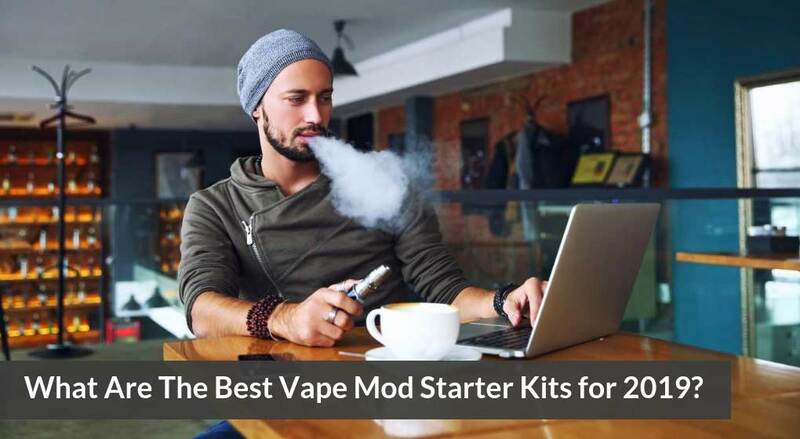 With this review, we will only discuss the vape mod starter kits that beginners should consider in their first forays into vaping. Vaping kits can come in a lot of different shapes and sizes, just like this cool discreet vape pen. What you need for your first starter kit will largely depend on what you are looking for in a kit. These recommendations can best be used by people who are looking for their first vape starter kit. All of these kits are user friendly. You can purchase these kits from excellent and reputable sellers that offer good warranties and customer service. The Reactor Mega vape mod starter kit is by far the best vape mod on the market today. This vape mod starter kit is equipped with a 5000 mAh that ranges from 1-80W. This vape mod kit is great because it has features such as, adjustable power, temperature control, and a smart mode, which stores resistance and power levels for up to 10 different tanks allowing for a better experience by customizing your vaping experience to suit your style. The Reactor Mega comes with a Reactor tank, which holds up 5 ml of e-liquid and houses a .15 ohm Ni200 coil head. Some of the pros include a long battery life, various settings allow for a customized vaping experience, replacement coils are inexpensive. The Juul is one of the more advanced starter kits being sold today. It contains the technology of a device half its size. This vape uses a system that any beginner can learn to use with ease before long. That’s because they won’t have to mess with any e-liquids, wattage settings, or coils. All you will have to do is plug your pod into the Juul and you’re ready to start vaping. You can choose from 4 different flavored pods, which costs less than $20 for a pack of 4. If you want to vape for the first time and are looking for a starter kit that is easy to use, then Juul is right for you. Some of the pros include a high level of nicotine, an easy charge, and a beautiful design. The only con is that the battery life, at 200mAh, is quite low. The Vertx Plus is a perfect vape starter kit for beginners because it has e-liquid pods that are already filled. All you have to do is slide them smoothly into place with a connection involving magnets. You won’t have to mess around with e-liquid bottles or coils. Once you slide the pods into place, you can start the vaping. The Vertx Plus has a touch screen where you can increase or decrease your voltage. It also contains a battery meter that tells you when you need to recharge. If you don’t want a touch screen, you can purchase the Vertx Plus for about $50 less. The magnetic pod system, touch screen, and battery are all big draws. The only real con to the Vertx Plus is the placement of the firing button. It kind of makes the process a bit harder for beginners. But most people will get used to it after a while. The product really is worth this minor hassle. If you want to purchase one of the more advanced cig-a-likes on the market, then you should consider purchasing the V2 EX Series E-Liquid Starter Kit. This reviewer recommends that beginners get the e-liquid kit. That’s because the e-liquid kit comes with clearomizers that create a large amount of vapor for such a small kit. If you’re a beginner that doesn’t want to refill any clearomizers, then you can purchase the cartomizer kits. 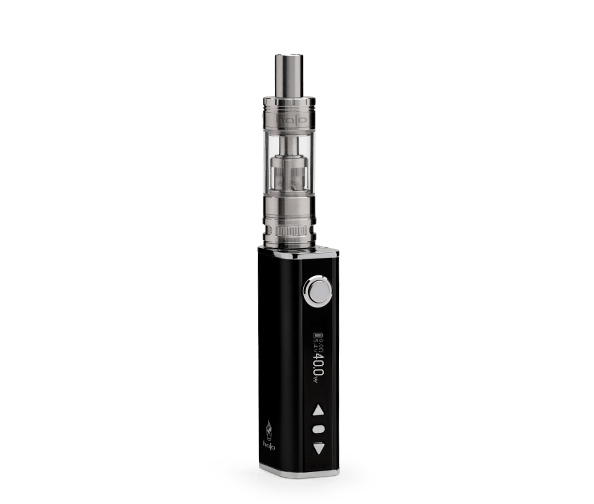 This kit features a battery indicator and has a very long battery life for a cig-a-like. If you’re just getting off cigarettes, the V2 EX Series Starter Kit is a perfect start to your vaping journey. 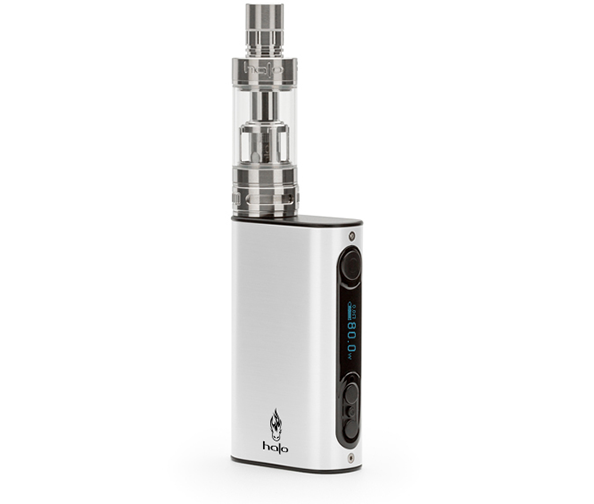 Its small size and nicotine options act as good reasons why you should buy the V2 EX Series. There are no real cons other than that the cig-a-like is a bit bigger than an actual cigarette. However, this shouldn’t bother most beginner vapers. If you’re looking for a stealthy vape that is full of flavor, look no further than the Vaporfi Express Starter Kit. The kit has two batteries that each have a different size and capacity. The larger has a better battery life while the smaller one promises a high amount of portability. This starter kit also comes with three mini-tanks and a carrying case. If you’re so inclined, you can even make your own e-liquid blend. The mini-tanks, or clearomizers, give you a lot of vapor and flavor for such a small tank. Vaporfi gives all of its customers a 30-day money back guarantee and excellent customer service. 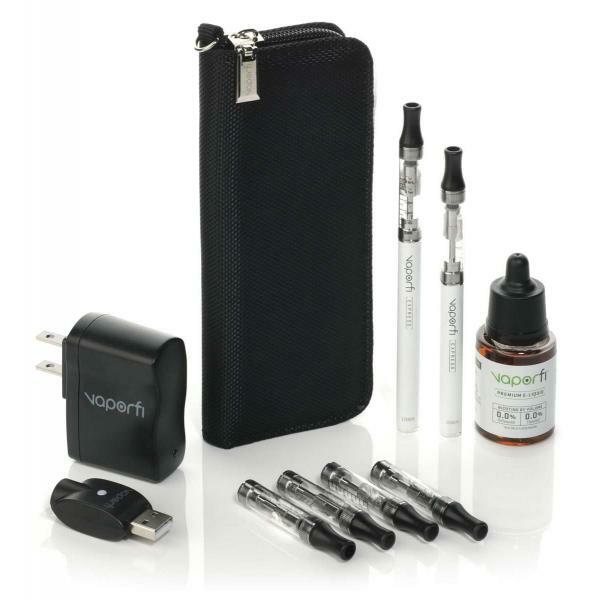 If you’re looking for great flavor from your vape starter kit, then you should buy the Vaporfi Express Starter Kit. Not only do you get great flavor with the Vaporfi, you can also create your own e-liquid. The Vaporfi is pricier than other kits, but it’s well worth the price. If you’re looking for great variable wattage mods that are easy to use, have good ergonomics, contain a lot of power, and come with a long-lasting battery, then you should consider the Halo Reactor Mini. So many vape mod pens on the market are really advanced for beginner vapers. The Halo Reactor gives you a lot of that same power without all of the fuss that you would get from the other mod vaping pens. The pen features 40 watts of power and 2600mAh hours of battery life. Not only does this pen perform at an amazing rate, you won’t have to learn any technical information in order to use it. While this is not a pen for an absolute beginner, you can keep the Halo Reactor in mind for when you want to graduate from the “Vaping 101” pens. With the Halo Reactor, you’ll get an easy to use pen that has 40 watts of power. The only real downside to this pen is that it doesn’t come with any temperature control mechanism. Most users who rated this pen highly didn’t see this as much of a problem. They adjusted their use accordingly. Reebok shoes have been around for a long time and their brand name is one that can be trusted to deliver quality products at a fair price. 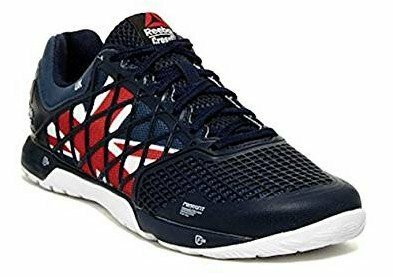 Started in the humble bedroom of Joseph William Foster in 1895, Reebok continues to make a variety of running shoes, lifting shoes, cross training shoes, and walking shoes. Partnering with the CrossFit technology of Greg Glassman, Reebok offers over 19 styles and 35 models from which to choose in their CrossFit line that will enhance and add form to your most grueling workout. 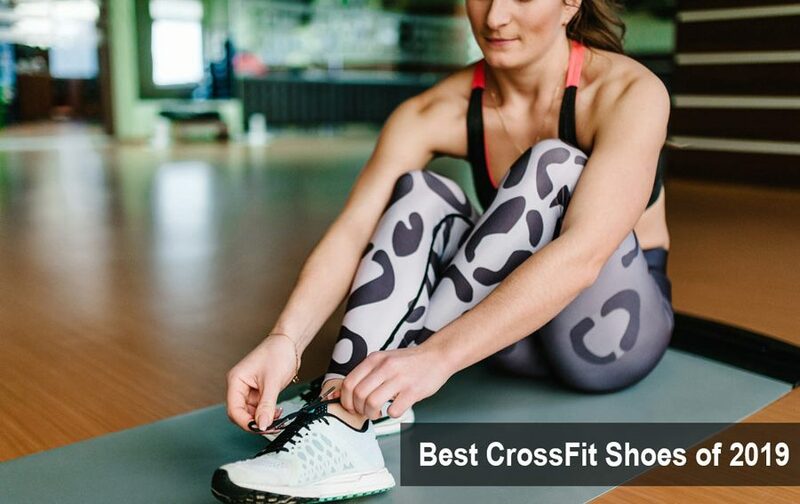 Going into 2019, there are so many Reebok CrossFit options available to round out your closet, new ones and updated old favorites, it's tough to settle on only one pair. Let's take a look at what's available today, some of their key features, color, style, customization, and cost. For those of you who likes lifting weights regularly, Reebok has some top of the line lifting shoes to keep your balance stable and in style. Designed specifically for lifters, the Reebok Legacy Lifter is a stylish and functional shoe available in most sizes for both men and women. Its sleek design conforms to the shape of your foot while the two adjustable top straps secure the shoe in place. The Reebok Legacy Lifter keeps you looking good while offering firm support and comfort. Designed in collaboration with CJ Cummings, these shoes are the epitome of technicality blended with beauty. The 3/4” heel grounds your torso during squats, while the structure of the shoe conforms to your foot, offering your body the crucial foundation needed during heavy weight lifting. Your footing stays secure with gripped rubber outsoles, while the TPU heel piece that runs through the midsole gives your feet the control and stability needed during from the pick up to the put down. The cushioned ankle and Achilles pad ensure a comfortable fit, while the patented Exoframe offers extra stability and support. The mesh leather uppers allow for breathability while not compromising comfort. The Reebok Legacy Lifter weighs in at 16.7 ounces with a 22mm Drop (3/4”) and the basic pair comes in white, black and pewter. There are a variety of Reebok shoes geared towards men and specifically designed to optimize a CrossFit performance. 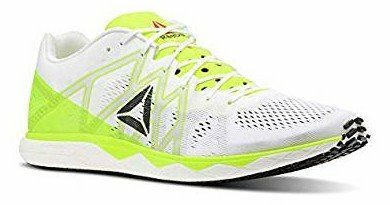 Searching the Reebok website returns a large variety of different styles of CrossFit shoes available for men from which to choose. Below are a few of the most popular shoes for men. If you're looking to buy a pair of men's CrossFit shoes, the Reebok Nano CrossFit 4.0 will certainly fit the bill. 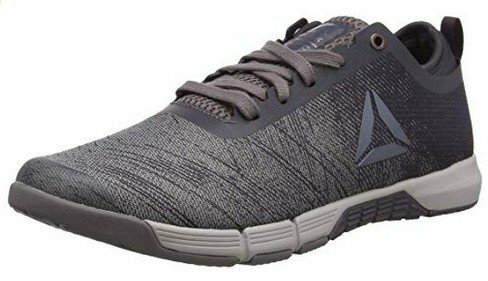 With a whopping 1100+ reviews on reebok.com, and a telling four and a half stars for their look, style and performance, these shoes really shine as one of the flagship men's shoes for Reebok. Comfortable? Check. Stylish? Check. Versatile? You bet. These shoes have all the bells and whistles needed for a stable and comfortable workout. Using the patented DuraCage technology for a light and airy upper, this shoe is sturdy. Climbing ropes are a breeze with the RopePro wrap that gives you a steady and secure grip and cling. The forefoot and heel are cushioned for maximum support and comfort, even during your most brutal CrossFit workout. A 4mm drop gives you the flexibility and stability you need, while the the multi-surface outsoles help keep you grounded. The Reebok Nano CrossFit 4.0 comes in a variety of styles and colors. 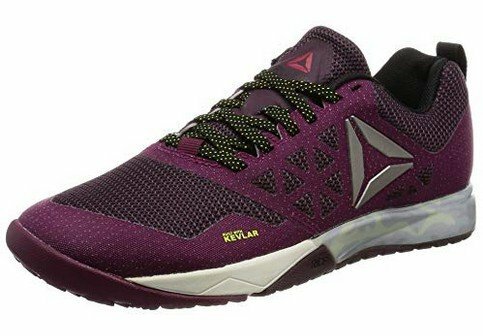 With stellar five star reviews, the Reebok CrossFit Nano 6.0 Covert is a bargain at around $130. Designed with the challenges of rope climbing in mind, the shoe itself is masterfully flexible and the sandpaper-like material offers stick and grip for moments when you need maximum hold. Using Reebok’s ROPEPRO technology, it’s hard to find a better shoe for the ropes. But the functionality doesn't stop there. This shoe is versatile enough to wear through any cardio and high-intensity workout too. The compression-molded midsole keeps the impact at a minimum while flex grooves keep you mobile on the floor. Style, comfort and versatility make these shoes a perfect match for your CrossFit Workout of the Day (WODs). Basic colors are black, Reebok Rubber Gum, white and pewter, but other styles are available on the Reebok website. The Reebok Crossfit Nano 6.0 Covert is also customizable. Check out the Reebok website for all of the available options. Reebok pulls out all the stops when it comes to making CrossFit shoes for women. With a variety of styles and colors to fit every need and workout, you can be assured there is a CrossFit shoe that will work for you. The Reebok CrossFit Nano 2.0 ushers in stability while keeping you mobile. 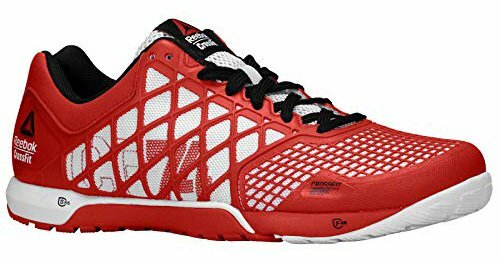 With the classic Reebok CrossFit Nano 2.0 low-cut ankle and low profile platform, you will move freely through those CrossFit Workout of the Day (WODs). Overheating won't be an issue with the light mesh upper that offers you maximum breathability and ventilation. With sturdy construction, the reinforced outsoles and the DuraGrip toe cap makes for a longer lasting shoe that can withstand brutal force during that long CrossFit session. The Reebok CrossFit Nano 2.0 was designed with stability and support in mind, especially when making those lateral moves. The EVA midsole will cushion your feet, while the forefoot flex grooves will give your feet the flexibility they need. Offered in basic colors such as white, black and grey, they also come in Vitamin C for a brighter fashion statement. With various styles to choose from such as the Grace and Covert, Reebok has something for every CrossFitter. Reebok s constantly updating their technology to ensure that their shoes work best for the way you need them to work. The Reebok CrossFit Nano 4.0 is no exception. A tried and true training shoe, the ROPEPRO technology gives a solid side grip that will help you shimmy that rope securely. With DuraCage technology, the shoe is strong, lightweight and comfortable. Deep cushioning in the front and back of the shoe help to absorb some of the impact during those more intense workouts. A 4mm drop adds to the overall stability and ease of movement. 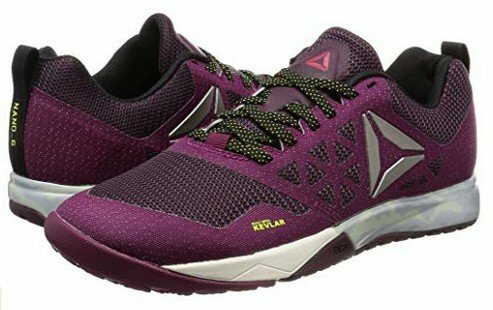 Just like its counterpart for men, the Reebok CrossFit Nano 6.0 Covert for women is a customizable shoe that is made for rope climbing, cardio, and intense CrossFit training. Equipped with all the same bells and whistles as the men’s version, this shoe will carry you through your workouts with style, stability and functionality. The Reebok CrossFit Nano 6.0 Covert is a good buy. Comes in several fashionable colors to keep you looking good, even during your deepest sweat. The Reebok CrossFit Nano 8 Flexweave was first developed in 2010, and Reebok works each year to improve its design. The patented Flexweave figure-8 technology creates a shoe that is flexible, but strong. Just as the name suggests, the Reebok CrossFit Nano 8 Flexweave was designed to handle a variety of CrossFit Workout of the Day (WODs) with style and comfort. The ankle is low-cut allowing your foot to move better during those intense side-to-sides and forefoot flex grooves make for a shoe that gives where you need it to give. Hailed as Reebok’s “most versatile and dependable CrossFit shoe in the box,” the Reebok CrossFit Nano 8 Flexweave brings shoe technology to a new level where comfort and durability meet breathability and stability. The toes are reinforced with Toe Tection meaning you can do your workout without worrying about that random toe blowout. Reebok has your heel covered as well with a new heel bootie that is beyond comfortable. They weigh in at 8oz with a 4mm Drop and come in a variety of colors. Available for men or women in numerous colors, but whether you choose white, skull grey, pure silver or primal red, you will be looking good every minute, on the minute. 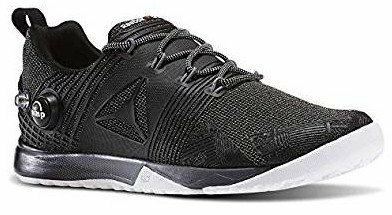 The purpose of having a marriage with CrossFit is to up the game of Reebok and create shoes that can go seamlessly from the gym to the street. They have achieved this with the Reebok Speed Her TR. Touted as the shoe that can “go from sprints, to weights, to abilities, and back in one shoe”, the Reebok Speed Her TR gives you the flexibility, strength, durability, and comfort to lift in the morning and sprint in the evening. 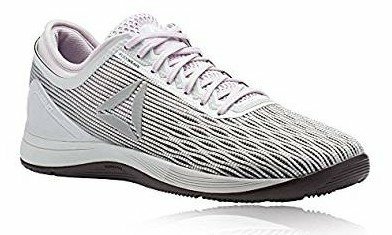 As with most of the shoes designed specifically geared towards CrossFitters, this low-profile shoe has a short cut around the ankle for comfort and flexibility. The upper is flexible, yet offers the basic support needed for weight reps or a short run around town. Tastefully designed, the shoe is a lightweight and sensible alternative to bringing several pairs of shoes for the transition from lifting to running. Leave it to Reebok to create a universal running shoe designed for both sexes. Designed to be the ultimate racing shoe, it is light, fast and ready for any length race. Any runner knows how important it is to have spring in your step and the Reebok Floatride Run Fast Pro delivers. With soft cushioning from tip to tail, this ultra lightweight shoe will make you feel like you're running on marshmallows. The Floatride Foam helps to saves wear and tear on your joints with its patented cushion that run the length of the shoe. Custom mesh uppers are light and airy, letting your feet breathe during short or long runs. Fit is key when piling on the miles. The Reebok Floatride Run Fast Pro has stretch boogie construction and an EVA sockliner that hugs your foot, giving you a secure run with minimal slippage. To curtail the external slippage, there is a high traction outsole that is thin and streamlined. If you're looking for a shoe that is lightweight, streamlined, breathable, and offers flexibility for any run, short or long, the Reebok Floatride Run Fast Pro is the ticket. Also good for tempo workouts and intervals, this shoe weighs in at a mere 3.25oz. and has a 6mm Drop. Available in white, Solar Yellow, black or steel. 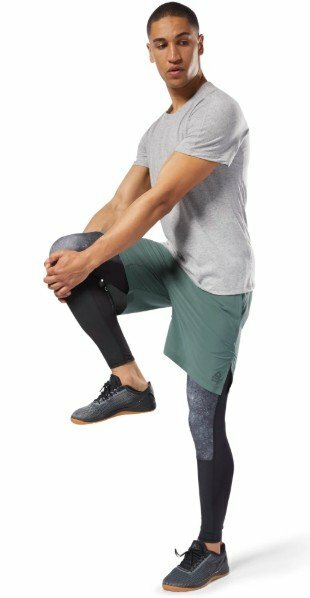 Sizing on reebok.com defaults to men, but is universal for both sexes. These are only a few examples of Reebok shoes that work well for a strict or variable CrossFit workout. Whether your forte is lifting, running, rope climbing or a mix of all the cross-training WODs, Reebok has a shoe to fit your intensity, style, look, and overall preference. Whether you choose an out-of-the-box shoe or customize your own fit and look, Reebok will deliver with the professional comfort and quality you've come to expect from Reebok. Visit a reebok.com for more information on these and other shoes available for 2019 and beyond. 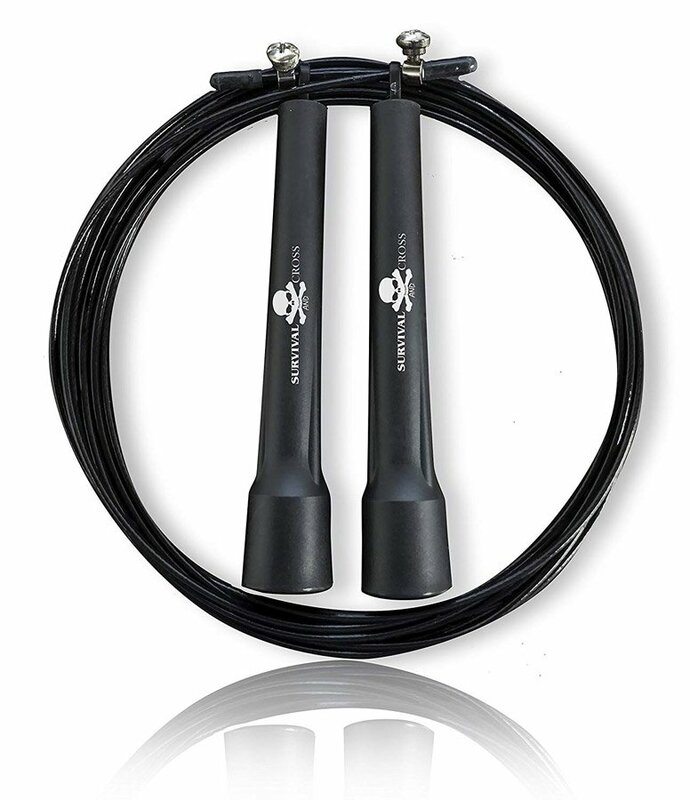 The jump rope is a very versatile and convenient exercise tool. It is easy to carry and can be used both indoors and outdoors, allowing you to go carry it with you to competitions, while travelling, or wherever you want to do a quick WOD. Not only that, the jump rope has many great benefits and can do wonders to burn calories and improves body fitness in various ways during a cardio workout. It is great for weight loss, helps tone muscles and increases cardiovascular fitness. Cognitive functioning and coordination are also improved by regular use of Jump ropes. It is a must have for anyone concerned about fitness. If you are new to crossfit or have been doing it for a while and are in need of finding the best crossfit jump rope then this guide should help to point you to the perfect one for your WODs, buying a jump rope shouldn't be hard so we took the best of the best and compiled an unbiased review of them all. The WOD Nation Speed Jump Rope is a top pick. Replacement hardware, extra cable and a nylon drawstring bag are given with it for free. This jump rope for crossfit is designed to be fast and allow for more stability. the handles and cable are durable, and it also has a 100% guarantee, promising good customer service. The length of the metal coated rope is adjustable. 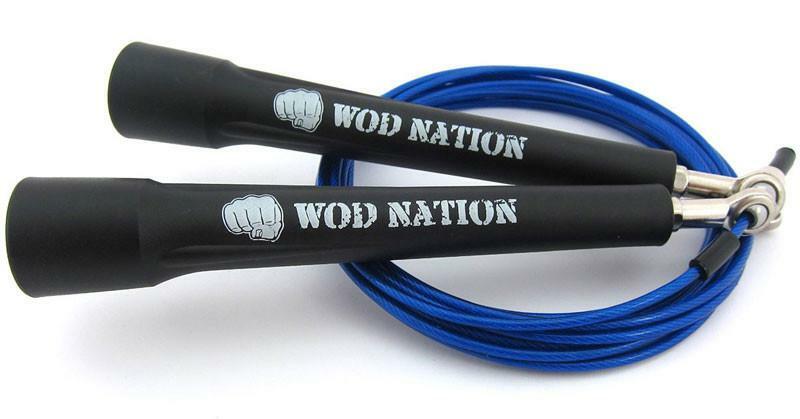 The WOD Nation jump rope is available in nine colors, including black, red, blue and purple. The rope slices through the air easily to make double-unders easier to do. The best option for Boxing and MMA training on top of crossfitting is the Survival and Cross Jump Rope. 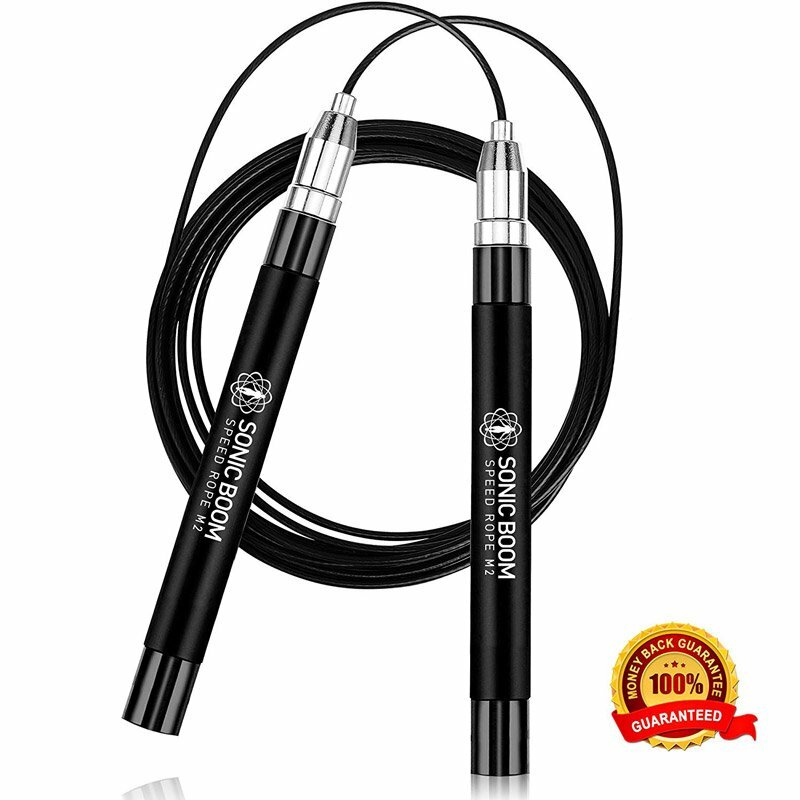 This crossfit jump rope comes with a 5” handle and a 10 foot cable which makes it great for both tall and short people as you can customize the length of the cable. Extra hardware is also given as part of the box kit and it can be adjusted to your height. It has steel bearings which have been added to increase speed. Its weight is perfect for long cardio sessions, double-unders and if just starting out at crossfit, singles. Its size makes it easy to store and carry in any gym bag making it easy to transport to and from your crossfit box. 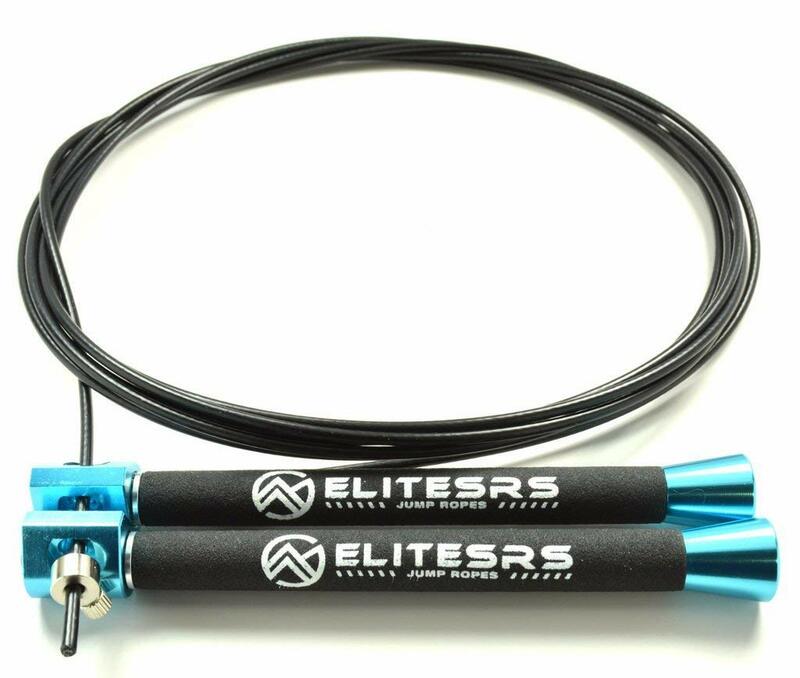 The Elite Surge Jump Rope has 5.25” High Grade Aluminum Handles with Slip-Resistant Foam grips increasing speed and smoothness of the rope attached. It comes with a 10 foot kink-resistant rope and is also compatible with six different types of cables, both Thick Outdoor and Ultra-Thin Cables, PVC Freestyle Cord and 3/32” Nylon Coated Rope. The screw/collar system allows you to easily adjust the length of the rope to your requirement so whether you have short or long arms this rope can be adapted to work for you. The patented dual ball bearing heads increase the smoothness of spinning the rope and improve your workout by making double unders easier to do. The cable has six color options including copper, black and blue. The Elite Surge Jump rope increases your speed, agility and stamina and is a great choice for training for Boxing, Muay Thai or cross fitness. 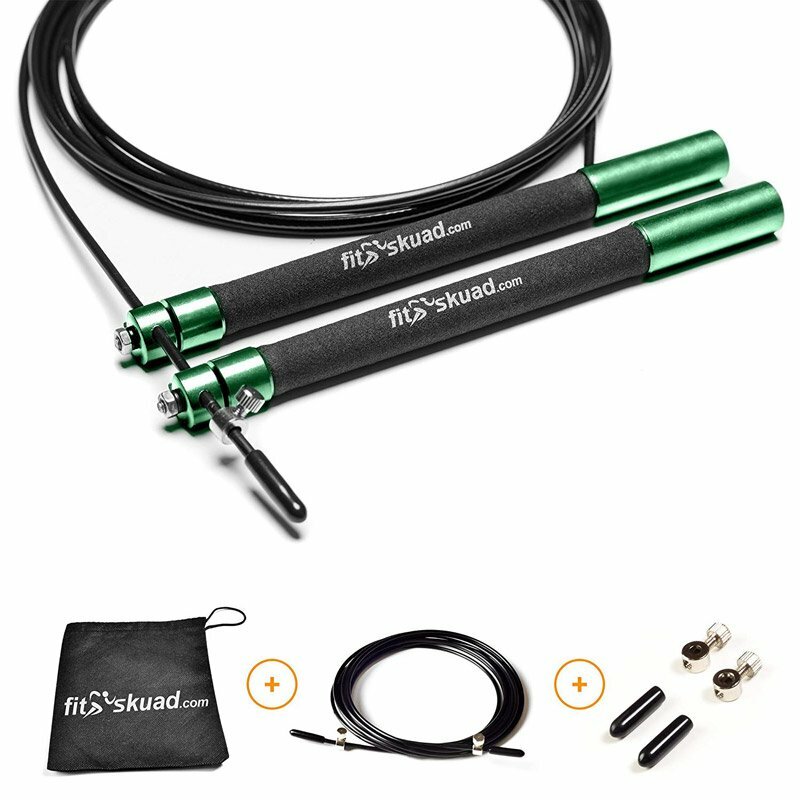 The Fit Skuad Jump Rope is made for both professionals and beginners. Its 6” Aluminum handles are light, durable and have foam grips for better handling. The 10-foot-long rope is easily adjustable, with extra-large screws, appropriate for both adults and kids. The rope design is coated with a PVC sleeve for protection, allowing you to use it outdoors and on hard surfaces as well without worrying. Fitted with an efficient double ball-bearing system, the rope has a balanced weight and allows you to reach great speeds, even up to 320 jumps per minutes. With the rope, you get a one year Limited Warranty and also a 120-day Replacement guarantee. You can carry the rope anywhere in the premium carrying bag given free with it. The Sonic Boom Rope is made for athletes and built for speed which is great for crossfit workouts! The 6.6-inch stainless steel handles ensure durability and the silicone grip on top gives a firm and comfortable grip. The problem of loose screws has been done away with the addition of Self-locking, screw free, jump rope. To achieve high speeds, a 360-degree spin ball-bearing system has been added, for increased rotation speed. Two 10-foot speed cables are given, which have 0.1-inch steel wire covered with polymer coating. A carry case and Luxury Gift box is given for free as well which means you don't have to worry about a tangled mess inside your gym bag. 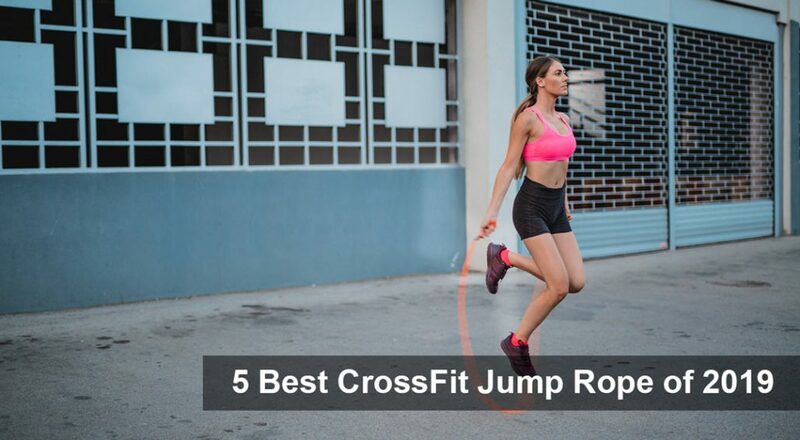 Hopefully this list above will help you in finding the best crossfit jump rope for you. Each one has a different feel so sometimes it takes testing them out and finding the correct on before being able to RX jump ropes in your WOD. Whether you are looking at perfecting your singles or looking to learn double unders, these ropes are the best of the best and will help you with your training. Most people that give smoke cooking a try want a smoker that is straightforward, simple and easy to use. When you understand your smoker well, the risk of messing up your foods is so much lower. You know exactly what to expect from your smoker and every smoke cooking session results in the exact same perfectly smoked meats and foods. But there are others out there that prefer a bit of diversity. They love to explore different smoke cooking methods, play with recipes and want unique flavored smoked foods every time they turn on that smoker. If you are one of those people who love unique tasting food every time you go cooking or someone who loves to combine cooking techniques then you will adore the Southern Country 4-in-1 Electric or Charcoal Smoker and Grill 5035U4-511. 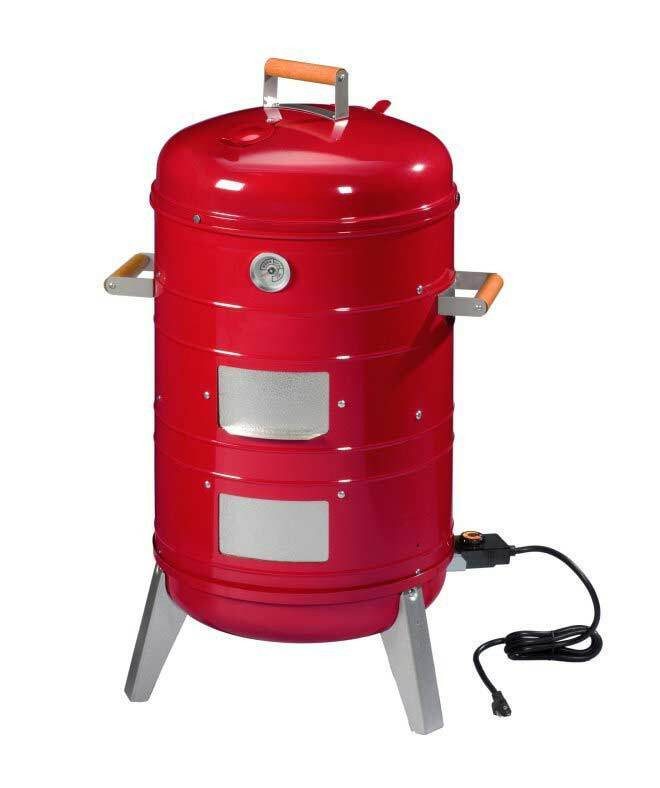 This smoker differs from all the rest because it functions via electricity and charcoal, allows you to smoke-cook food or grill food or to smoke steam food if you please. It is one of the most diverse smoke cookers in existence and a must for those who love to explore. This smoker is quite different in design. Unlike most smokers, it has around stackable and interlinking design. Overall it looks great thanks to its brilliant red color that should add quite a bit of charm to any outdoor kitchen or barbecue area. The features are the most important part of the smoker. You do,386 after all, need something that can do the job and we do believe that this little smoker/grill will surprise you. 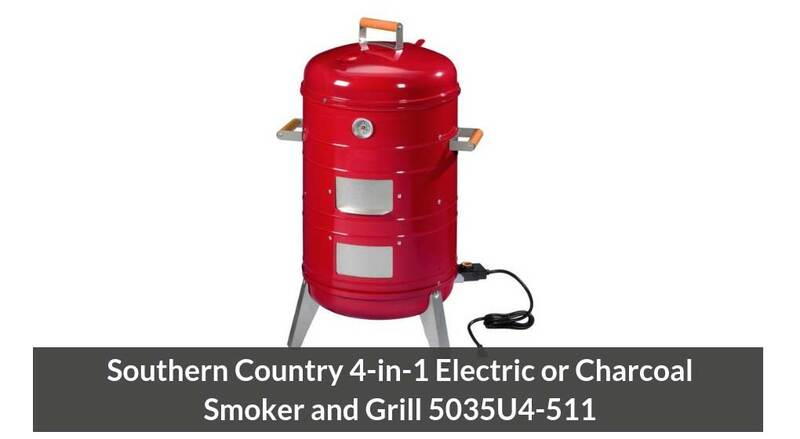 Here are the top features of the Southern Country 4-in-1 Electric or Charcoal Smoker and Grill 5035U4-511. Control – The 1500 watt smoker works with analog temperature control with different heat settings and will get your wood chips alight and your smoker nice and warm in no time at all. It also functions manually or off the grid with charcoal and a combination of charcoal and wood chips can be used for grilling and smoking food combinations. Use – The smoker isn’t quite as easy to use as other smoker models. The design is stacked and while it is simple to assemble, it doesn’t give you quite the same ease of monitoring foods as you cook because it isn’t that easy to open and close it to see how your foods are doing. But other than that, it is pretty easy to operate thanks to the analog temperature control and basic design. Capacity – This 26 x 18 x 18 smoker has a food capacity of 350 square inches which is sufficient for smoking up to 22 burgers at the same time. It certainly is big enough for your small to medium family. Weight – At only 27 pounds it is a pretty mobile smoker. Water pan – the smoker also has a 5.5-quart water pan that keeps your food nice and moist while grilling or smoke cooking. ​Adding the element of comfort as you meditate can transform your whole meditation session. Sitting in one position for a long period of time can take a toll on your body. As meditation helps you relax mentally, it is important that your posture gets proper support so you can sit in one position. Your lower back takes quite a toll when meditating and if you are not used to it, you may even experience some pain, if you don’t sit properly throughout the session. So how does a meditation chair help with this? No matter if you already face back pain or not, if you are beginning to meditate you want to make sure your posture is proper. 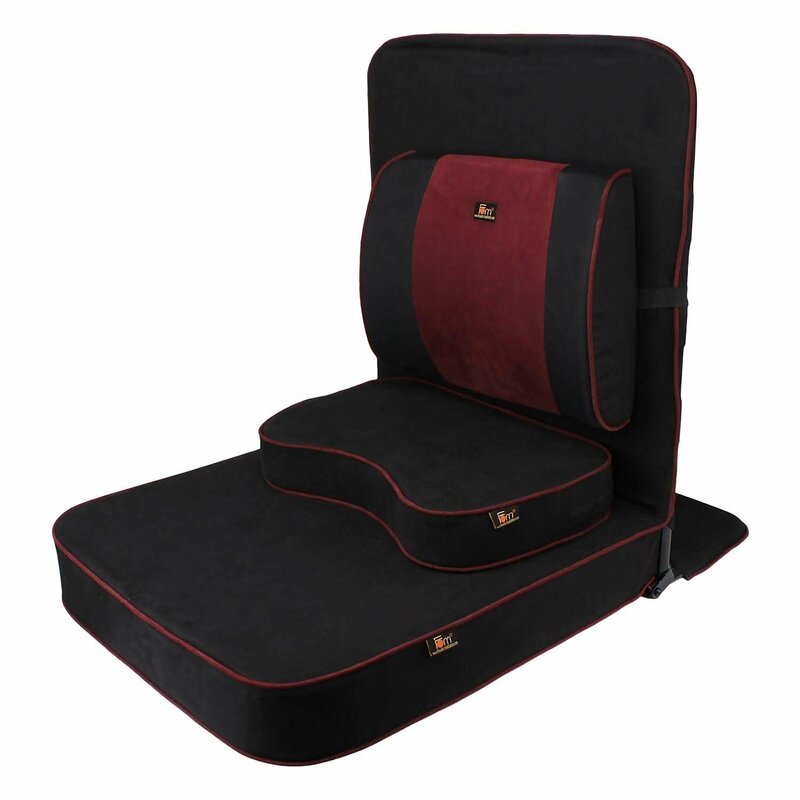 A meditation chair provides you with back support, some even provide added padding for the lower back so you can sit in the proper posture with support. Without the chair, most people start to slouch and cannot maintain a straight posture, which is also an important aspect of meditating. 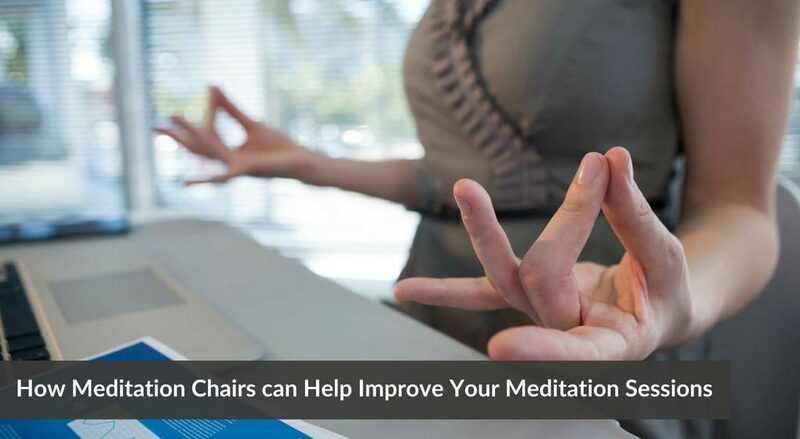 Meditation chairs provide more comfort. For some, it may be hard to sit with their legs folded on a mat while others may want back support. Meditation chairs are designed specifically for meditation and chairs like Friends of Meditation Relaxing Buddha chair are designed to provide comfort in exactly those spots which many beginners feel pain in meditation posses. These chairs are designed specifically for mediation to provide users comfort. The added comfort and the ability to maintain your posture will automatically change your meditation session, improving it drastically. Without having to worry about any type of pain, you can automatically focus on your mental health as the physical element will be taken care of. You can find different types of meditation chairs in different shapes and sizes. Find one that fits your needs and provides you the added comfort you are looking for. It will truly transform your meditation sessions.